Tikki mehndi design is the origin of all the mehndi designs. It is being loved by all age group girls and ladies. The style is not about the current ongoing trend; it is about which you can easily carry with the simplicity and elegant touch.Gol Tikki mehndi design is still re-introducing with some unique and eye-catching designs. You may have seen various trends, but no pattern can compete till now with this design. We are having a wide variety of Latest Tikki Style Mehndi Designs For Hands 2018 to make this struggle easier for you. Years back, girls used to dissolve henna in water and let it rest, after letting it gain color for a while, they used to grab matchsticks and a toothpick to apply henna from the bowl they mixed it in. And the result was commonly the very loved design of various patterns of the circular style. Since it is hard to apply multiple styles and the women committed enough to want that precision didn’t put too much of those in it. In the past decade, there was a prevailing trend among girls of getting intensely detailed mehndi designs on their hands. The more intricate the pattern was, the more they loved it. However, recent trends have shifted towards the traditional side with big and bold patterns. We are back to the circular Tikki style 2018. This was one of the most favorites in the ancient era all over the world, especially in the subcontinent. Creativity and intensity of doing something will bring out something exceptional and when will you draw that exceptionality on hand, you will have an immense feeling, and this will turn out something different for you. Let’s have a look at our sophisticated and mind-blowing compelling range of circular mehndi designs which have totally refurbish the tradition of Asian women. Now you can grab style and culture equally. Get ready for the latest Tikki Mehndi designs of 2018 in the town. If you just give a glance at this design, you will imagine bracelets around the wrist following Tikki style have been applied. Wrists are beautifully covered with round mehndi design. This is the most difficult design for nowadays. I saw several girls having these design beautifully. Mehndi is not darker enough it just seems like the design have been applied by sharp tip similar to a pencil. This is not thick like other designs which we use to have. The appearance of circular Arabic mehndi design would look intricate. Girls can have these design for any occasion. It would just enhance the glamorous look of their hand. It’s not imperative to fill your whole fingers with mehndi design. You can spare your fingers space as you can see in the picture. The only middle finger has been filled with the Gol Tikki Design on the backhand. You can make flower or petal under the nail tips just. It will look stunning. If you aspire a mehndi design, go for the circular mehndi design like in the image below. This style has a great traditional background, and it appears amazing. Nowadays, Pakistani brides go for the Tikki mehndi designs as it appeals the sight. If you are going to be a bride soon, this mehndi impression will look fabulous for sure. You can get the detailing up to the requirements of the event! When it comes to Eid and other occasions, you can get a less detail with your Tikki henna design. If you want to look classy and traditional, you can wear this criss-cross print. To give yourself a traditional appearance, you can grab a few colorful stones. Wear some decent accessories and bangles and it will give you elegant persona. Watch here our stunning collection of Turkish henna designs for hands and feet in which criss-cross pattern is common. Are you looking for a pleasant and conventional appearance? Try this henna style, and it will make your expectations up to the mark. It is a common now to make your tikka design in a leafy pattern which will adore your mesmerizing hands. Every Pakistani female desires a style that makes her a traditional yet pleasing mehndi look! Don’t Miss the latest Pakistani henna designs. These days, mehndi is transformed in such a way that it is losing its conventions! Being traditional, try this design and be the one who is stylish as well as traditional. This is a simple circular henna design which can be given a speck of a bit detailing and transforms into best stylo mehndi art. 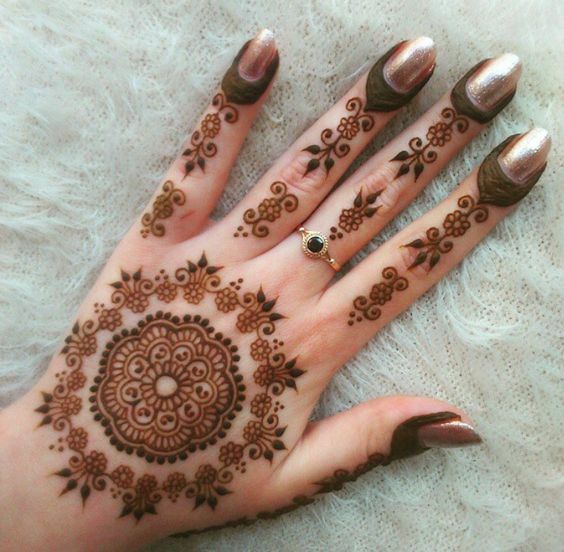 Are you thinking this henna design is just for grabbing the attention of inner hands? If yes, then you have the wrong perception. Some traditional touch is given to backhand design as well. You can try this design that can be made instantly with an instant henna cone. You can transform a simple circular mehndi in the floral format, and it looks amazing. For having the charismatic and more attractive appearance of hands on the coming Eid, then be the stunner of this ravishing design. If you are trying it as a wedding mehndi design, extend it to the wrists or slightly above the wrists. Back in 60’s, we had a trend of circular Tikki henna styles. It is still there but a bit renovated as you can see in the image below. Go to the salon and ask the henna artist or expert to get this on your backhands. Details ought to be neat and clean. Good glittered mehndi designs really appeal the eyes. If you are tired of old tikis, go for this style. It’s not a great deal to apply it in your hands but needs a bit practice. if you really desire to give you a perfect and paramount conventional look, you should give it a try. An immediate one can be a real and endearing choice to use as your henna design. Every female here in Pakistan craves for the best design that makes her beautiful and sight-grabbing. Try this as your style and rock the floor with the beautiful and best instant henna design. This spectacular design will leave each bride spellbound for having mesmerizing styles.